As much as we try to protect our children from harm, there are many difficult circumstances facing school-aged children today. As parents, you may at times feel overwhelmed with the challenges of raising children in our fast paced and stressful society. Whether you are raising children as a single parent, married couple, or blended family, there will be times when you may need guidance or support in coping with your child’s behavior. Given the stressors facing families today, many parents find that taking children to see a child therapist individually, or getting family therapy, can greatly help in navigating the paths of childhood and adolescence. Some common issues facing school age children are: conflicts with siblings, school issues, bullying, learning disabilities, eating disorders, childhood anxiety, insomnia, childhood trauma related to death or illness in the family, Obsessive Compulsive Disorder, separation anxiety, and adjusting to divorce or blended families. Some children are born with a more anxious or sensitive temperament, others are born naturally strong willed or oppositional. These children can be challenging for parents who may not know how to adjust their style of discipline or care-taking for their child’s specific needs. Often working with a therapist who specializes in child therapy given parents an objective perspective on what is happening, and how they can best respond to the child’s behavior. I also specialize in using EMDR with children who have been affected by childhood trauma. If you are not sure whether or not to seek help for your family or your child, I offer a free 30 minute phone consultation to help you assess your situation and make recommendations. 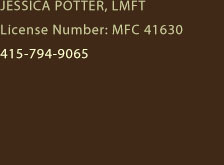 Jessica Potter LMFT, specializes in working with adults, teens, children, and families. Her specializations include EMDR therapy for treating trauma, Substance Abuse treatment for groups and individuals, moderation management for problem drinkers, and therapy for adults who are hearing impaired. Serving clients in Marin and Sonoma Counties.